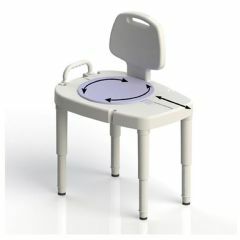 AllegroMedical.com presents The Sliding Rotating Bathroom Transfer Bench. The Maddak Sliding-Rotating Transfer Bench eliminates the need to step over the side of a bathtub or the ledge of a shower making it easier and safer to get in and out of the tub/shower. Never have to worry about slipping or falling again. this transfer bench has a built in soap tray to make cleaning convenient. Have a unique or odd shaped tub or shower? The quick adjust legs makes it easy as 1-2-3 to make this fit your home! The sliding feature enables a person to smoothly move across the bench with little effort and reduces stress on a caregiver's back by making it easier to maneuver a person. Does the swivel slide to the side and then slide back? Does Trsfr Bench have locking mechanism?